What’s not to love about the Coromandel? Cathedral Cove and Hot Water Beach are plastered all over the covers of magazines and guidebooks around the world, making them two of the most popular destinations in the North Island of New Zealand. But there is so much more to this peninsula, which sits just a few hours from Auckland. You would be hard pressed to explore all it has to offer in a single weekend. In our latest visit, we set out to do just that. 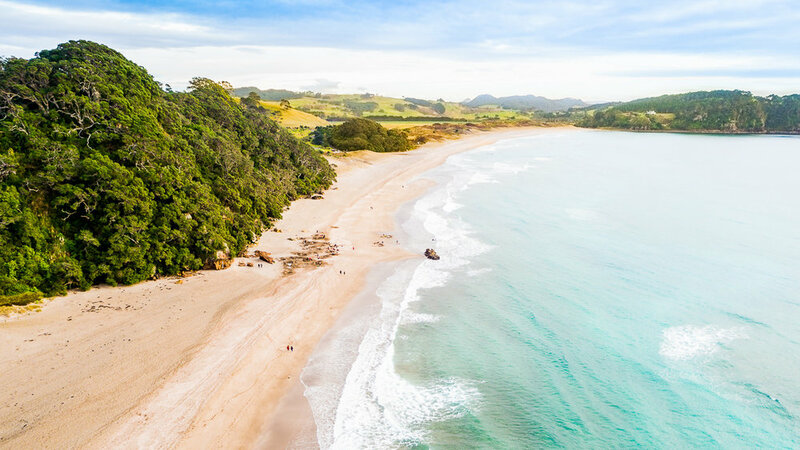 Our two-day itinerary for the Coromandel takes you to the most stunning places in the region (including some you may not have expected) and will inspire you every step of the way. If you are driving from Auckland, your first stop should be Karangahake Gorge. Located just South of the Coromandel, this is a great opportunity to stretch your legs and make the most of the morning light. The short rail loop track takes around 45 minutes and winds alongside the Ohinemuri River and through a 1100m historic railway tunnel. It is then just a 5-minute drive to Owharoa Falls, a hidden gem down a small set of stairs from the side of the road. These cascading falls offer a moment of relaxation amongst the swooping fantails. From there, take the road up to the Coromandel Peninsula. On the way you will pass through several small towns where you can find a spot for a quick bite to eat or a longer sit-down meal. To catch the sunset at Cathedral Cove, you will need to arrive with plenty of time to spare. The walk (up and) down to the beach stretches along the clifftops and surrounding countryside before winding down a set of stairs to the coast. A round trip without any stops will take you about 90 minutes, but you will want to stop and photograph along the way. The large arch is the main attraction, but be sure to walk through to the other side as the beach beyond features stunning rock formations. If the sky is clear, stick around for star trails or head into town and check out the Pour House for dinner and a drink. Tip! This is a very popular destination in the summer. We recommend visiting outside of peak season to enjoy emptier beaches, as well as later and longer sunsets. Start the new day with a sunrise from the bluffs at Te Pare Reserve. The sun will stream in over your shoulder as you look out at Hahei Beach below and up the coast towards Cathedral Cove. Once the sun is up, jump back in the car and head around the corner to Hot Water Beach. Enjoy a lazy breakfast and lounge in your beach pool heated by underground geothermal springs. Tip! Check the tide. The pools are only accessible two hours either side of low tide. Also, remember to bring a shovel, as you will need to dig a fresh pool for yourself. Most hotels will provide this for you. Head north out of Hahei and cut across the centre of the peninsula on the scenic 309 road. Your first stop will be a fifteen minute loop through the Waiau Kauri Tree Grove. These mighty trees grow over 50 meters tall, but are threatened by the rapid kauri dieback disease. The grove is protected with a small foot washing station on the way in and out of the track, which reduces the spread of the disease by stopping travellers from carrying it in on the bottom of their shoes. Driving just a little further down the road, be sure to stop again for the Waiau Falls, a fantastic end to your stay in the Coromandel. Put a towel down and make the most of the beautiful view. Tip! Take a towel to sit on and make the most of photographing this location. You'll also want to be careful on the very slippery rocks. From here, make your way back along the western coast through Thames and back up to Auckland. Got more time on your hands? Karangahake Gorge: The Historic Walkway to Waikino extends far beyond the shorter Karangahake walk. It will take up the better part of a morning (4 hours return) and allows you to walk to Owharoa Falls before exploring the remains of the deactivated mining facilities which once covered the area. Te Pare Reserve: Consider returning later in the day, particularly in the winter, when the sun sets over Hahei beach and the coasts beyond. Colville: For a full extra day, consider driving to the very North of the Coromandel Peninsula to enjoy this quiet town, surrounded by a number of little-known but charming beaches. The Church is a small hotel a very short drive away from Hahei beach and other attractions. We were well received with tips of where to go in the surrounding areas for both photos and food. In the Summer, the hotel operates its own restaurant, The Church Bistro. The Pour House in Hahei serves craft beer and a straightforward menu to suit all tastes. It is open year-round and is a favourite amongst the locals.